In keeping with her campaign promise to give attention to Filipinos who are at the fringes of society, Vice President Leni Gerona Robredo intends to visit the "farthest and smallest barangays" in the country. The newly-installed Vice President wants to touch base with Filipinos and to know what they want changed. Thus, Filipinos can expect Robredo to go around the country in the early part of her vice presidency. In our first 100 days, we plan to once again go to the farthest and the smallest barangays to pray with you, to laugh and cry with you, and most of all to listen to the things that you want changed. Robredo wants Filipinos, down at the barangay level, to feel that the government is ready to listen and ready to work for them. We hope that as we bring the Office of the Vice Presidency to your barangay, you will feel the government is truly there for you, and when you feel that, you will be inspired to spark your own change as well. While President Duterte's focus is on crime and drugs in the first 3 to 6 months of his administration, VP Robredo has her own plans. 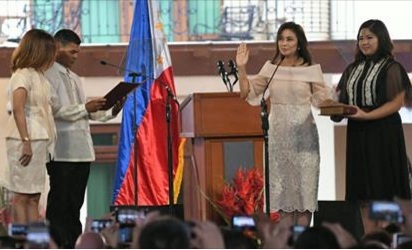 But VP Robredo recognizes the fact that she and the President have a common goal and vision, that is, to bring "real prosperity to our people, especially those that have been left behind"
VP Robredo encourages the private sector to unite with the government "in a partnership for change, for those at the fringes of society". Further, VP Robredo is also asking people who have a passion for helping the poor to come to her office and join her in tackling the following urgent priorities: hunger and food security, universal health care, rural development, education, and people empowerment.